This Friday, during the second hour of the Aquarium Drunkard show, we’re airing the AD session Melody’s Echo Chamber laid down for us at Red Rockets Glare Studios last Fall while in Los Angeles. We’re debuting it here, first — those of you sans satellite radio can download/stream the tracks below. And for those of you who missed it, the singer-songwriter’s swirling self-titled debut (produced by Tame Impala’s Kevin Parker) was one of our favorite records of last year. 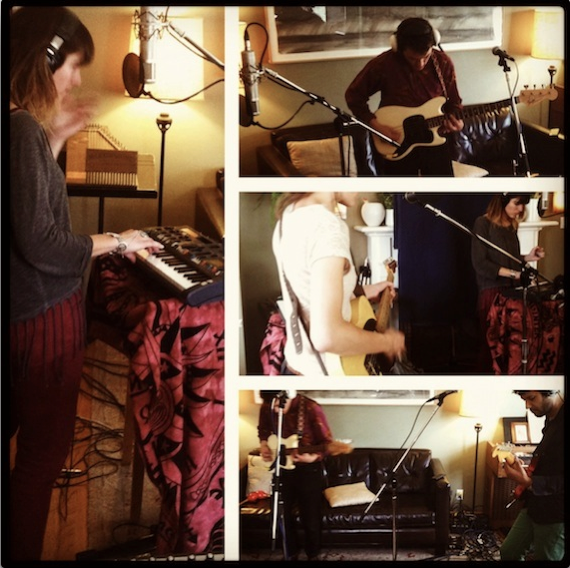 Pingback: Melodyâ€™s Echo Chamber – exklusive Aquarium Drunkard Session | nicorola - Ein Musikblog. ah, thank ya for the sneak peak here. The record is amazing, one of the best of the year, but it’s basically just Tame Impala with a girl singing. They’re even using samples of Kevin Parker playing for their live set. (Notice there isn’t a drummer in those pictures) Might as well be karaoke. @J – Just because Kevin produced the record doesn’t mean you can’t give Melody some credit. She wrote the lyrics, vocal melodies, and song structures to her songs and Kevin just did the psych instrumentation. The album is a collaboration between two great artists and it wouldn’t have existed had either artist been omitted from the creative process. J is obviously a tool that does not understand collaboration. Kevin Parker deconstructed and rearranged all of the songs Melody Prochet demoed for the album. This was as much of a collaboration as Phil Spector working with the Ronnettes was.